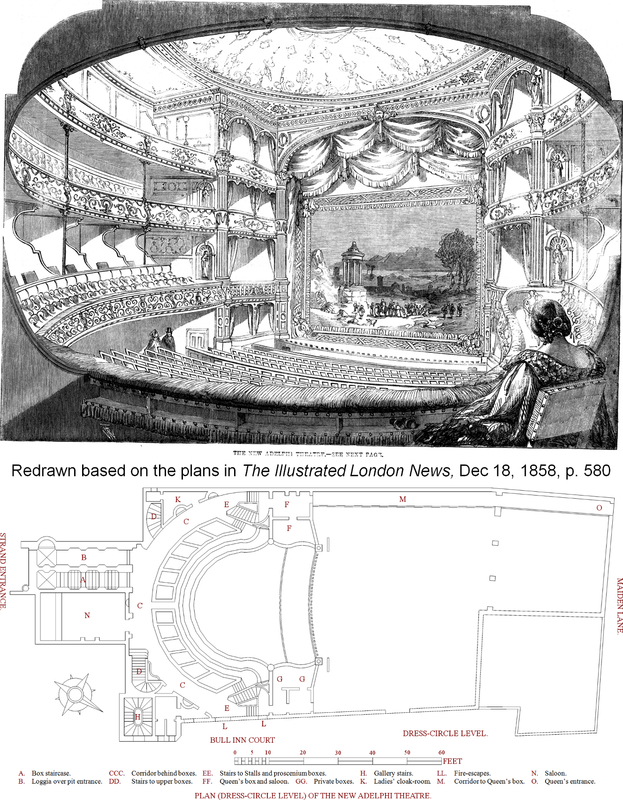 In 1858, Ben Webster demolished the theatre and constructed a larger, more elegant house in its place. The architect was T. H. Wyatt, and the decorative work was executed by Frederick Sang and J. H. Parsons. A new act drop was painted by Clarkson Stanfield. John Willson built a wrought iron roof supported by iron stanchions independent of the brick walls. Inside, the three circles were supported by widely spaced and slender-shafted iron columns. Excavating the ground made it possible to have the pit below the street level, making room for the extra tier. The gallery entrance was moved to Bull Inn Court. The new theatre could seat 1,500 people, with standing room for another 500. The interior was lighted by a Stroud's Patent Sun Lamp, a brilliant array of gas mantles passed through a chandelier of cut-glass. We cannot but admire the energy with which Mr. Webster has prosecuted his arduous undertaking, notwithstanding many discouragements and some of those misadventures which architects are "heir to" and has brought it at last to a successful issue. We congratulate him heartily upon the elegant edifice he has raised, and we congratulate the public, who in this new Adelphi will possess one of the most comfortable, nay, luxurious, theatres in the metropolis. It is no slight task to raise upon the ruins of the defunct a new and more splendid structure in so short a period; and Mr. Webster's friends and admirers—that is to say, the whole public--will not be slow, we are sure, to recognise the zeal, energy, and tact with which, he has laboured. May the new Adelphi be as prosperous in its generation as that ancient and famous Adelphi which Yates, Wrench, the elder Mathews, Reeves, and other choice spirits, immortalised! Under Mr. Webster's management, we know no effort will be spared to perpetuate its honourable distinction, and both dramatists and artists will find in him, as they have always found, a generous friend, a warm-hearted brother, and one of the most enlightened and persevering of the metropolitan managers. Mr. Peter Cunningham, in his "Handbook to Modern London," pithily speaks of him as "having done more towards upholding the English drama than any other person now connected with the stage." This is an eulogium which everybody knows to be well deserved, and everybody knows, too, that it would be difficult to exaggerate his merits as an actor who has created for himself a series of remarkable and elaborately finished characters. The new Adelphi will differ from the old theatre in many important points but above all in size. The annexed plan affords at a glance a confirmation of our statement. The eastward boundary of the old house, and the space allotted to the audience, are shown by dotted lines. 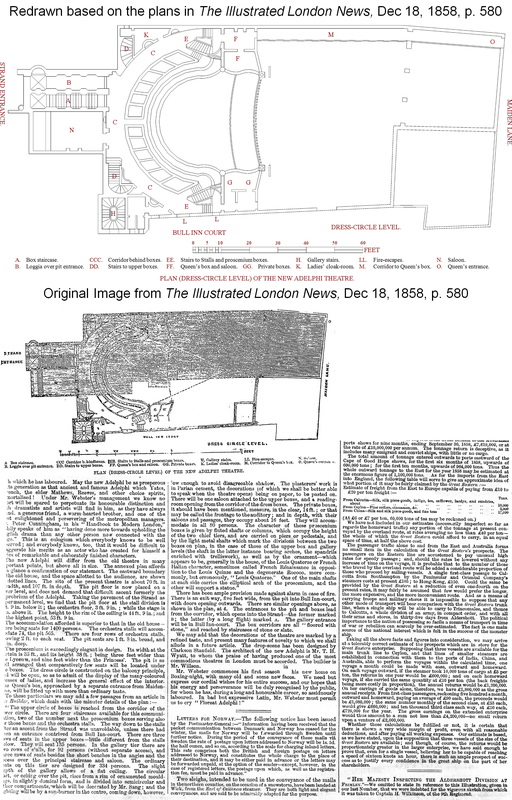 The site of the present theatre is about 70 ft. in breadth, and 107 ft. in depth. The pit floor is now placed on a lower level and does not demand that difficult ascent formerly the opprobrium of the Adelphi. Taking the pavement of the Strand as a permanent level, we find that the pit floor at the stall division is 2 ft. 9 in. below it; the orchestra floor, 3 ft. 9 in. ; while the stage is 5 in, above it. The height to the rim of the ceiling is 44 ft. 9 in. ; and to the highest point, 53 ft. 9 in. The accommodation afforded is superior to that in the old house--there being seats for 1400 persons. The orchestra stalls will accommodate 74, the pit 565. There are four rows of orchestra stalls, allowing 2 ft. to each seat. The pit seats are 1 ft. 8 in. broad, and 11 in. deep. The proscenium is exceedingly elegant in design. Its width at the curtain is 35 ft. and its height 38 ft. being three feet wider than the Lyceum and nine feet wider than the Princess'. The pit is so well arranged that comparatively few seats will be located under the boxes. The dress circle is constructed on the balcony principle and will be open so as to admit of the display of the many-coloured dresses of ladies and increase the general effect of the interior. The Queen's box, approached by a separate entrance from Maiden-lane, will be fitted up with more than ordinary taste. "The upper circle of boxes is reached from the corridor of the lower circle. There are four staircases available for this communication, two of the number next the proscenium boxes serving also for those boxes and the orchestra stalls. The way down to the stalls after an ascent from the Strand was unavoidable unless there had been an entrance contrived from Bull Inn-court. There are three rows of seats in the upper boxes—little different from the stalls below. They will seat 135 persons. In the gallery tier, there are two rows of stalls for 92 persons (without separate access) and three rows of seats besides the short benches in the angles and the recess over the principal staircase and saloon. The ordinary seats on this tier are designed for 334 persons. The slight depth of the gallery allows of a flat ceiling. The circular part, or ceiling over the pit, rises from a rim of ornamented mouldings, slightly domical form, and is divided into semicircular and other compartments, which will be decorated by Mr. Sang; and the lighting will be by a sun-burner [gas chandelier] in the center, coming down, however, low enough to avoid disagreeable shadow. The plasterers' work is in Parian cement, the decorations (of which we shall be better able to speak when the theatre opens) being on paper, to be pasted on. There will be one saloon attached to the upper boxes and a reading-room opening from the corridor of the dress boxes. The private boxes, it should have been mentioned, measure, in the clear, 14 ft.; or that may be called the frontage to the auditory; and in depth, with their saloons and passages, they occupy about 16 feet. They will accommodate in all 80 persons. The character of these proscenium boxes is given by fluted shafts or columns, which occupy the height of the two chief tiers, and are carried on piers or pedestals, and by the light metal shafts which mark the divisions between the two boxes on plan, in the case of those of the upper box and gallery levels (the shaft in the latter instance bearing arches, the spandrils enriched with trelliswork), as well as by the ornament—which appears to be, generally in the house, of the Louis Quatorze or French Italian character, sometimes called French Rénaissance in opposition to the Louis Quinze and the degenerate Rococo, were commonly, but erroneously, "Louis Quatorze." One of the main shafts at each side carries the elliptical arch of the proscenium, and the other will support a statue." There has been ample provision made against alarm in case of fire. There is an exit-way, five feet wide, from the pit into Bull Inn-court, with doors opening outwards. There are similar openings above, as shown in the plan, at 4. The entrances to the pit and boxes lead from the corridor, which opens into the Strand--the former marked B; the latter (by a long flight) marked A. The gallery entrance will be in Bull Inn-court. The box corridors are all "floored with stone," and reached by staircases of stone or slate. We may add that the decorations of the theatre are marked by a refined taste, and present many features of novelty to which we shall allude in a future article. The drop-scene has been designed by Clarkson Stanfield. 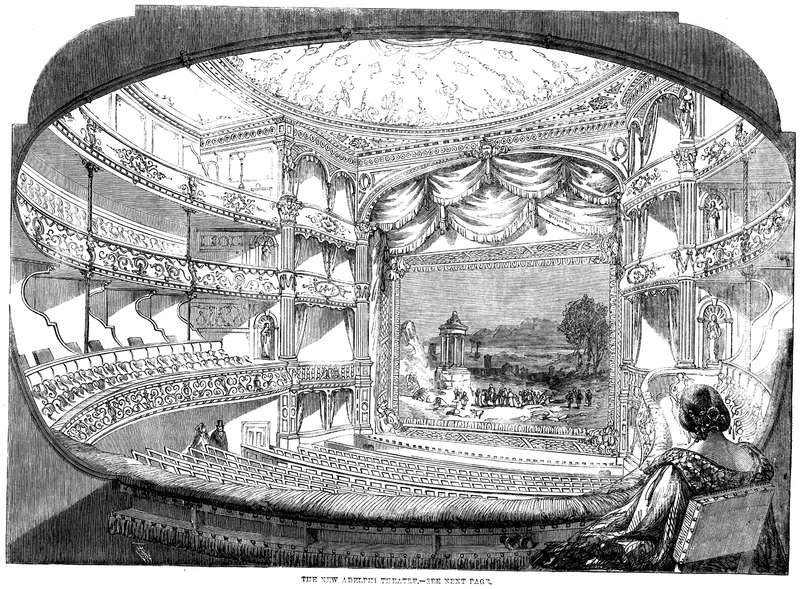 The architect of the new Adelphi is Mr. T. H. Wyatt, to whom the praise of having produced one of the most commodious theatres in London must be accorded. The builder is Mr. Willson. Mr. Webster commences his first season in his new home on Boxing-night with many old and some now faces. We need but express our cordial wishes for his entire success, and our hopes that his energy and perseverance will be duly recognised by the public, for whom he has, during a long and honourable career, so assiduously laboured. In bad but expressive Latin, Mr. Webster must permit us to cry "Floreat Adelphi!"